“Hearts” Coil Bracelet. $325. SOLD. With the fifth coil in The Love Collection, Wings honors marriage directly, invoking a couple’s act of giving their hearts to each other. A length of fiery amber lives at the center, flanked at either end by a single shell heart fetish, the paired hearts of name and act alike. 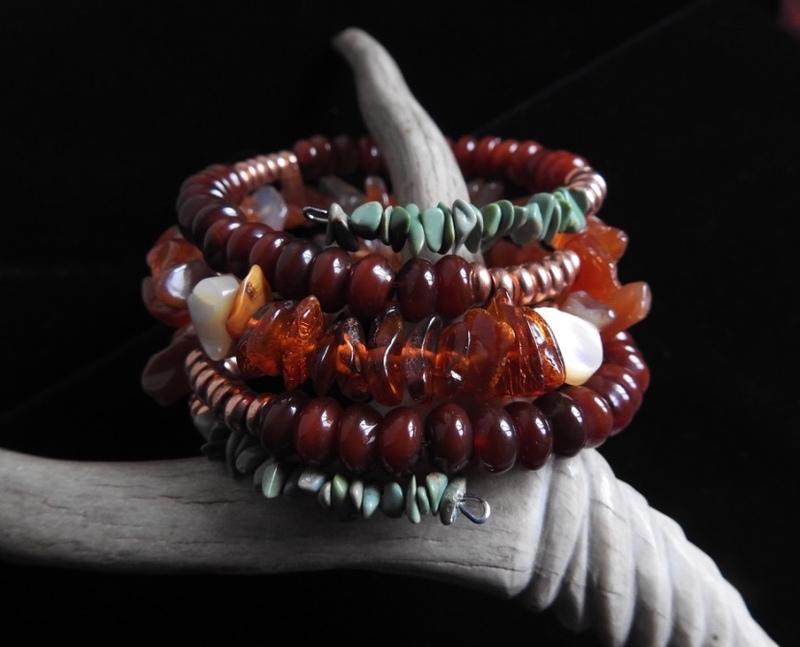 From the hearts, the coil flows outward into glossy carnelian nuggets the color of blood and fire and light, thence to dark red carnelian and then light red carnelian rondels. Each gemstone segment is separated by brilliant copper beads; the coil terminates at either end in earthy green turquoise chips. Beads are strung on memory wire, which expands and contracts to fit virtually any wrist. Jointly designed by Wings and Aji. Posted on Sunday, March 12th, 2017 at 10:20 pm. Filed under: The Coiled Power Collections, The Love Collection, The Seventh Fire Series	RSS 2.0 feed.